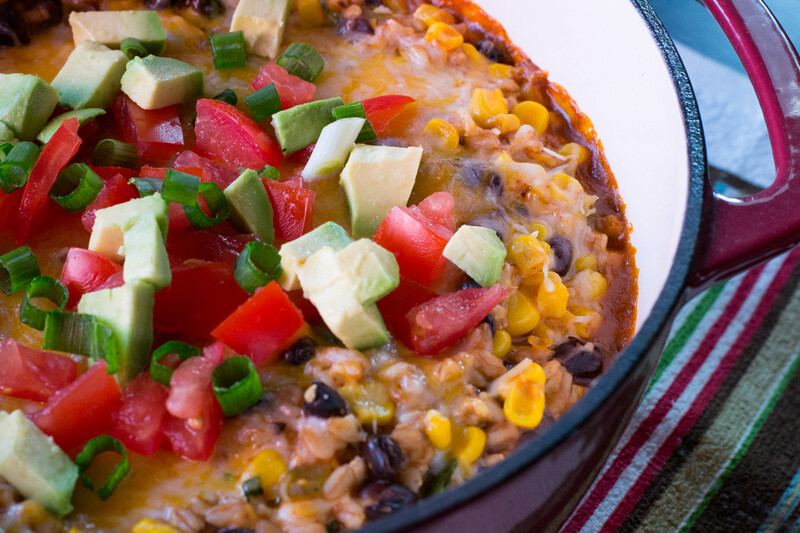 Farro Enchilada Casserole - What the Forks for Dinner? This post is for my friend Lindsay from the Brandywine. 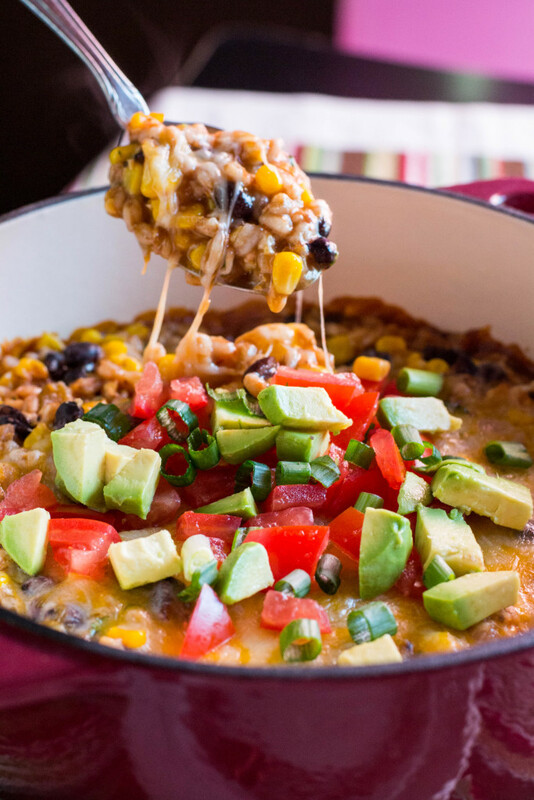 Farro Enchilada Casserole is a healthy lightened up casserole that is I think is close to Vegan with the exception of the cheese. As I researched Vegan, I found that some eat cheese and some don’t. So, if you are non-cheese vegan you can leave the cheese out, but I think it adds to the dish. I tried farro a while back and fell in love with it.It is often used as a substitute for pasta or rice. Farro is a grain with a nutty flavor similar to brown rice. It is rich in fiber, magnesium and vitamins A, B, C, and E. Anything that tastes like rice is OK with me. Plus it only takes minutes in my pressure cooker…..yeah I’m still on that craze! 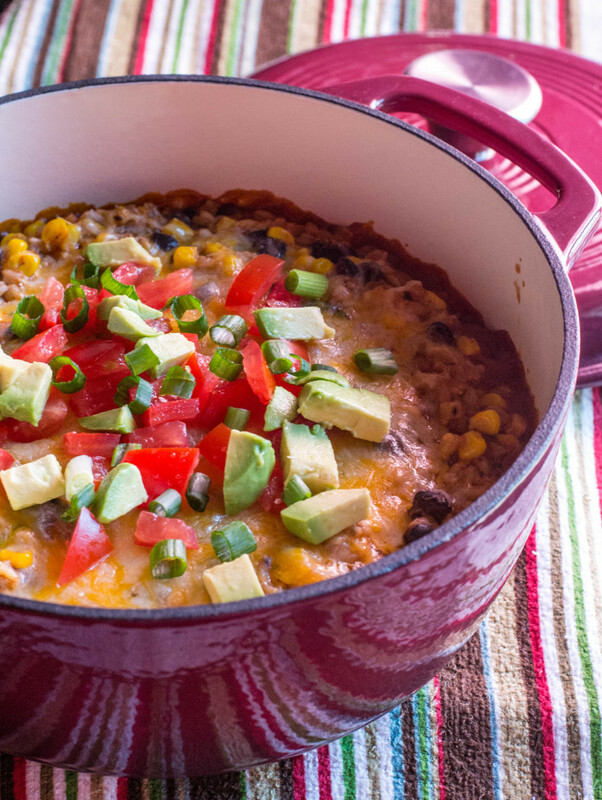 You can’t go wrong with a Mexican theme for any meal and I am a enchilada lover…….even with no meat. 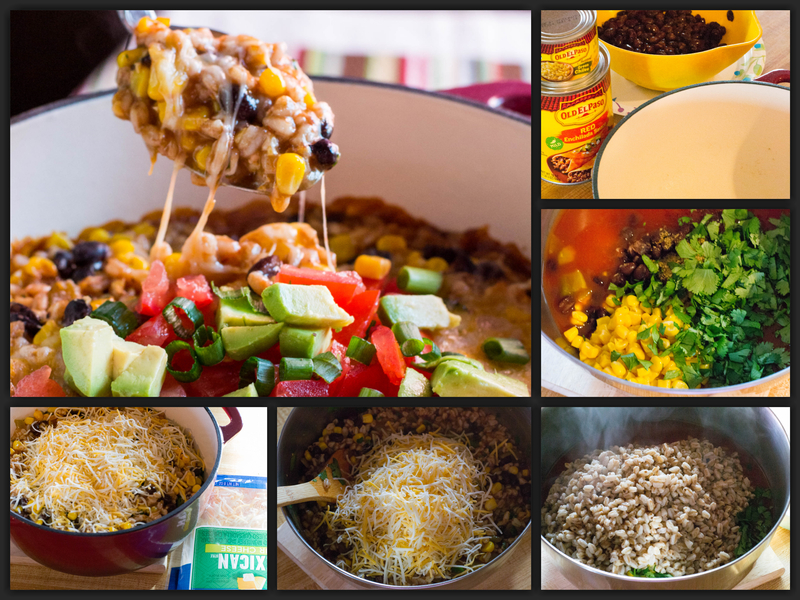 Black beans, corn, enchilada sauce, chilies, cumin and chili power added to cooked farro, then baked with or with out cheese. Can’t you just smell those spices……. Tomatoes, avocado, and green onions for garnish…….so tasty you won’t miss the meat. This dish makes plenty, so we had leftovers. For you carnivores……… day two recipe……..make burritos. We grilled chicken tenders, sliced them added them to the warmed casserole. Wrapped them in tortillas, with extra cheese and salsa……..they were awesome. 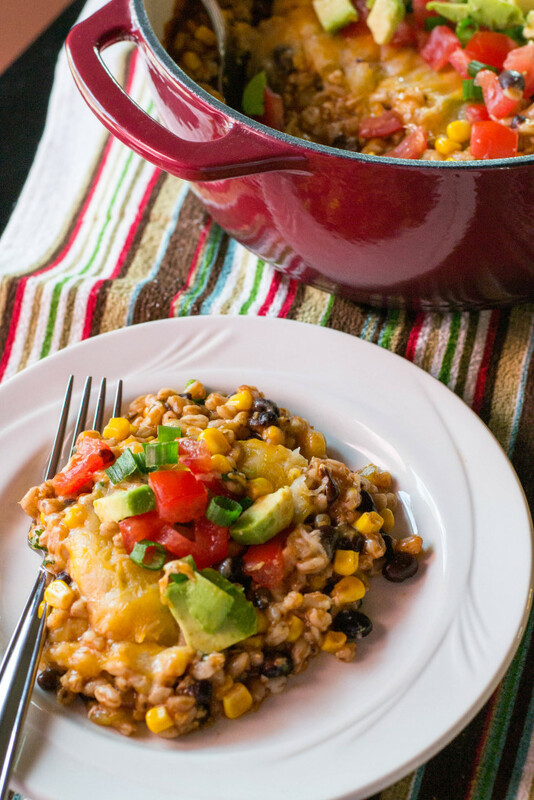 Farro Enchilada Casserole is a vegan/vegetarian dream come true recipe and on day two can be revamped to satisfy those who love the meat! Preheat oven to 375 degrees F. Spray a 2 quart baking dish with nonstick spray. In a large bowl, combine farro, enchilada sauce, green chiles, corn, black beans, cilantro, cumin and chili powder; season with salt and pepper, to taste. Stir in 1 cup Mexican blend cheese. Spread farro mixture into the prepared baking dish. Top with remaining cheese. Place into oven and bake until bubbly and cheeses have melted, about 15 minutes. Serve immediately, garnished with avocado, tomato, and cilantro if desired.